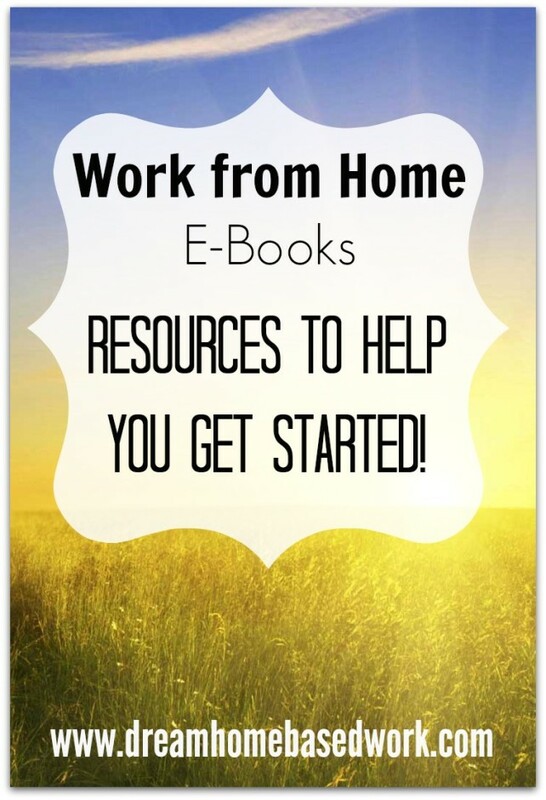 If you're tired of online scams and you're ready to make a real income online, there are many work from home e-books that will help you get started! eBooks are easy to use and store. They can fill space on your computer instead of space on bookshelves in your home. EBooks can be read on a PDF format online or printed to take with you when you're on the go. Unlike traditional books, as soon as you place your order, you will have instant access to hundreds of work from home ebooks. This is a monster list of ebooks that will give you information on the subject of working from home. Make sure to bookmark this page, as new resources are added to this list. This post may contain affiliate links. However I only recommend eBooks that are valuable to my readers. 101+ Real Companies That Pay! : This is a Kindle Book that gives you the names of companies who are willing to hire you to work from home. There are lots of positions available for you if you work from home and you can only find them if you read this book. ULTIMATE Work from Home JOBS: A step-by-step guide to finding legitimate work at home jobs with well-known companies : This Kindle Book gives you the exact steps you need to land a work at home job with a very big company. So what are you waiting for? Buy it Now and land the home job you have been dreaming of. 300 + Companies that Pay you to Work from Home : This E-book contains a detailed list of more than 300 companies that are available to hire you if you want to want to work from home. It does not matter whether you are a student, teen, work at home mum or dad, you would find something of interest in this book. Work from Home Data Entry Jobs: If you are looking to make money by performing data entry jobs, then this is surely a must buy for you. It shows you tips and tricks for data entry and also gives you about 100 companies that hire Data Entry specialists. Start Your Own Virtual Assistant Business In Just 21 Days: Turn a Profit by Day 30: This book gives you all the information you need to start your own Virtual Assistant business and rake in monthly cash from it. Exploring a Career as a Virtual Assistant: This book explains all you need to know about starting a career as a virtual assistant. It will also help you decide if this might be the perfect career path for you. How To Make Money Blogging: How I Replaced My Day-Job and How You Can Start A Blog Today:: This is a best-selling book by a professional blogger that teaches you how to make money blogging from the comfort of your home. How To Blog For Profit: Without Selling Your Soul: It does not matter if you have been blogging for years or just a few weeks, How to Blog For Profit (Without Selling Your Soul) offers solid advice and practical action plans for creating an authentic, successful, and profitable blog. Free Tools for Writers, Bloggers and Solopreneurs: This short, high-value e-book will point you in the direction of free apps, software and online tools to help with productivity, organization, social media management, content creation, and much more. 31 days To Build A Better Blog: This is a comprehensive blogging guide that gives you 31 tasks you can carry out in 31 days so your blog can begin to receive massive traffic you've always envisioned. The Accounting Interview Guide: An Insider's Guide to Acing Accounting Interviews: Do you have a dream to work in a top Accounting firm? Then “The Accounting Interview Guide” is a must read for those who want to arrive prepared and turn interviews into job offers. Accounting For Dummies: This book teaches you everything you need to know about Accounting. It is very explanatory and well recommended especially if you do not have prior knowledge of Accounting. Work-at-Home Company Listing for Accountants:: This book is a detailed guide of some of the famous companies that hire accountants to work from home. Freelance Writing Jobs: 101+ Online Writing Jobs: This books shares amazing tips and tricks you need to succeed as a writer. It also shows you more than 100 writing jobs that are available for you. The Moonlighter's Guide to Online Writing For Immediate Income: This book is a comprehensive guide of how you can start raking in money by writing from home. The Renegade Writer: A Totally Unconventional Guide to Freelance Writing Success: This book shows you most of the strategies used by professional freelance writers to succeed in their writing job. Medical Transcriptionist: Is it the Right Career for You? : This book will provide you with all the information you need to decide whether taking a job as a medical transcriptionist is exactly what you need. Become a Non-Medical Home-Based Transcriptionist: Would you like to know about the various opportunities available to a non-medical transcriptionist? Then this book will show you a detailed list of various transcription positions available to you and how you can make money from them. How To Make Money With Paid Online Surveys: Get Paid To Fill in Simple Forms Online: If you are looking to make cool money from home, then getting paid to fill simple forms online is the best way to do that. This book will show you all you need to know about making money from online surveys. How To Make Your First $1,000 With Online Surveys: Would you like to make money by airing your opinion? Then, this book will show you how to make your first $1000 with online surveys. The Everything Home-Based Business Book: Everything You Need to Know to Start and Run a Successful Home-Based Business: This E book shows you all you need to know in order to start a successful home based business. Home-Based Business For Dummies: This book provides tips and advices by experts on the steps you need to take in creating your own Home based business. Connect with me on Clarity! You can schedule a time to chat so I can provide guidance to point you in the right direction. Looking forward to connecting with you!